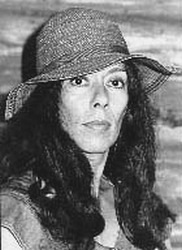 Yona Wallach (1944-1985) was born in Petah Tikva, Israel, and was raised in Kiryat Ono (of which her father was a founder). Her father died when she was a young child. 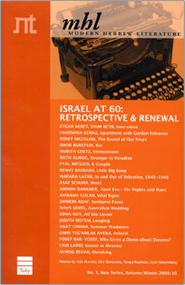 Wallach was active in the "Tel Aviv poets" circle which emerged around the journals Achshav and Siman Kriah in the 1960s, and was a frequent contributor to Israeli literary periodicals. She also wrote for, and appeared with, an Israeli rock group, and in 1982 her poetry was set to music. She died in 1985 following a protracted illness. Characterized by "an abundance of nervous energy," Yona Wallach's work combines elements from rock and roll, Jungian psychology and street slang in a body of work known for its break-neck pace and insistent sexuality. Writing in fluid lines, refusing to be limited by any conventional poetic structures, Wallach took upon herself the feminine revolution in Hebrew poetry. As she presented a provocative, blatantly sexual female figure, she became a stylistic model for many women poets. Wallac received the Tel Aviv Foundation Award twice (1973; 1977), the Kugel Prize (1978) and the Prime Minister's Prize (1978).